How would you like to save $1,176,916? 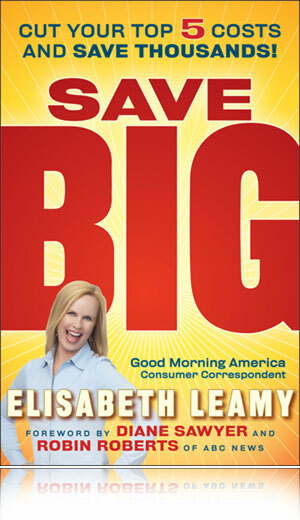 Elisabeth Leamy shows you how! Fight junk closing costs when you take out a mortgage and save $2,530. Instead of just refinancing, refinance into a shorter mortgage. Save $103,536. Appeal your property taxes (only 2% of people do!) and save $1,265 a year. Buy a “dark horse” car instead of the most popular make and model and save $6,814. Pay cash for your car instead of taking out the typical 5-year loan and save $2,608. Exercise a “secret warranty” where the dealer fixes flaws for free and save $1,400. Ferociously guard your credit score and save $93,600 over the life of your mortgage. Undergo credit rescoring before finalizing a mortgage and save $72,000. Negotiate for a lower credit card interest rate and save $1,272. Buy groceries when they’re cheapest instead of when you need them and save $5,772 a year. Master creative couponing (Click don’t clip!) and save $7,956 a year. Do nothing –literally nothing—and save $1,800 a year by using up what you have. Raise your health insurance deductible, cut out the middleman, and save $2,700 a year. Take an over-the-counter drug instead of the identical prescription one and save $1,763. Hire a medical billing advocate to fight hospital billing errors and save $6,858. That’s what I’m talking about when I say SAVE BIG! By contrast, most experts suggest a litany of Small Stuff Savings. Install low-flow showerheads, save $5. Pack your own lunch, save $7. And the classic: give up your daily latte, save $4. Peanuts! Pennies! Pathetic! Why give up life’s little pleasures when you can save more money by attacking a few big, boring expenses instead? For that matter, some people already have cut out the small stuff and it’s not enough. You would have to deny yourself 294,229 lattes to achieve the savings I show you in SAVE BIG! The book will save you money and this website will save you time. It’s an extension of the book. In SAVE BIG I often refer you to indispensable websites. I provide direct links to them here so that you don’t have to hunt around for the particular pages you need. I also sought out the best possible calculators to help you be a super saver, and they are compiled here too. Explore the other features of the site and check back often, because the BIG Blog is updated weekly with fresh savings ideas –including many from readers like you.